Does your living room have a huge flat screen TV? Is it dominating the room? Wouldn’t it be nice if it was out of view when not in use? 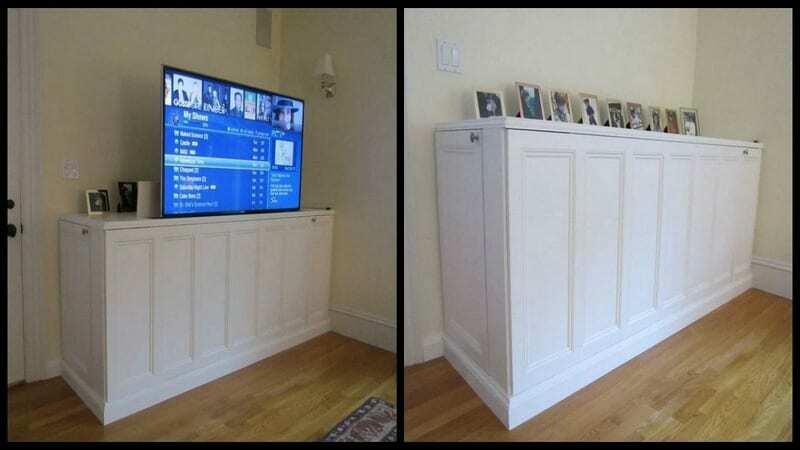 Here’s a great solution to make that flat screen TV disappear when it’s not in use. And you can do it with the hit of a button! This great looking cabinet will hide the television using a lift mechanism and a universal remote control. What’s great about this cabinet is that it looks so natural, you won’t even know that it hides that television, unless you’re aware of its purpose. 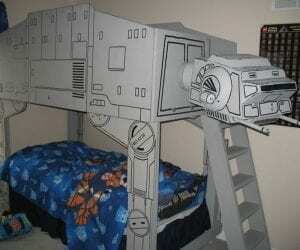 It’s also stores and hides your remotes, DVD players, game consoles, and other home entertainment items. Do you want your TV to magically disappear when not in use? Then learn how to build this DIY TV lift cabinet! Nail Gun and Compressor – to hold wood while the glue dries. This video shows how to remove the front panel for access to the inside of the TV Lift Cabinet. There is also a plywood cut sheet with recommended cuts from each sheet of plywood to allow maximal efficiency of your plywood panels. The sheets can be pre-ripped in your lumber yard or home center for easier carrying in your car. Of course all measurements should be double checked for your application and may be converted to metric. The documents are in Word so that you can easily modify them for your needs if your application or installation is different. When choosing your plywood sheets, be sure that they are not warped or bent. Line each one up and sight it with your eye. Reject the warped pieces. Cutting large sheets of plywood can be tricky. If you have access to a panel saw with a good plywood blade, you are golden. If not, there are some tricks. – The first is somewhat dangerous and you need a helper. Set up your table saw outside with the fence and guards removed. Mark your lines on the wood and pass the large sheet of plywood through the table saw blade with you pushing and your helper catching. Go slowly and accurately. – The second method is to lay some 2 x 6 pieces on a smooth floor. Lay your marked plywood on the floor and slowly cut your lines with a skill saw with a plywood blade installed. – Please double check ALL the measurements and dry fit your parts before drilling, nailing or gluing. 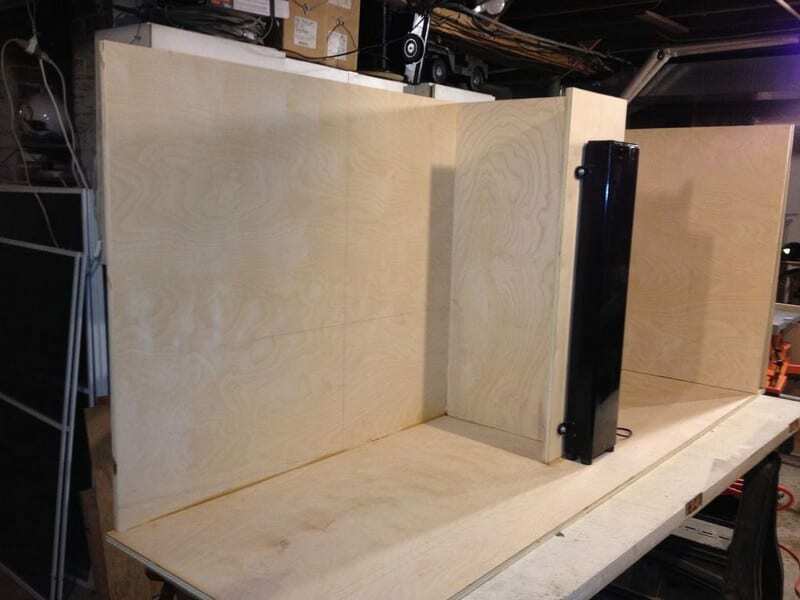 – You may find it useful to cut parts from the larger plywood sheets as the project progresses. It gives you a better ability to check for errors. The downside is that you have to setup the table saw each time. You’ll need a helper for this first assembly step. Most of the other ones can be done solo. Reference the top view drawing. Before you start assembling the carcass, make sure that you will have enough room and a plan to get it to it’s final location. It is 26″ wide which should fit through any doors BUT it is 87″ long so it may be tough to get around corners. – Lay the Bottom piece “G” on a flat work surface. I use an old door on adjustable saw horses. Set it up so the back and right side are hanging over the edge of the work table. You will be shooting nails up into this area. – Put Glue on the bottom of the back piece “Back” and get your helper to hold it in place. – Put Glue on the right side of the “Back” where piece “E” will connect to it..
– Put Glue on the bottom of the right side piece “E” and get your helper to hold it in place against the back piece. – Shoot 3″ framer nails to secure the right piece “E” to the “Back” piece. Shoot nails from underneath into the bottom to secure the Back and piece “E” to the bottom. Your helper is done! – On the Back of the carcass, mark 42.75″ from the right edge and draw a vertical nailing line on the back. Drill a few small holes through this line to carry through your vertical nailing line to the inside. – Put glue on the back and bottom of “C2” and center it on these nailing holes you just drilled. Check with a square that “C2” is 90 degrees square to the back and to the bottom. Nail through the back to secure “C2”. – Put Glue on the front of “C2” and on the bottom of “C1”. Center “C1” on the front of “C2” and nail through “C1″ into C2”. We will continue adding the vertical members to the carcass here. Reference the top view drawing. – Mark the inside back and bottom of the carcass with a line that is 11.5″ away from the right edge. Drill a few small holes 3/8″ to the left of this line on the inside back. Go to the back of the carcass and connect the holes with a straight edge to make a nailing line..
– Add glue to the top back and bottom of piece “D”. Install it with the right most edge on the line you just marked so the inside dimension is exactly 11.5″. Go to the back and nail piece “D” in place. – Go to the left side of the carcass and mark a line on the back that is 25″ in from the left back edge. drill holes 3/8″ over to the right of this line. Mark this line on the back. Mark another line 25 3/4″ over from the left side bottom edge. – Put glue on the bottom and back of piece “B” and nail in from the back on the 25″ line. – As shown in the drawing, draw a line 18.5″ parallel to the back. – Put glue on the back and bottom of the “H” piece. As viewed from the left side of the carcass, it should attach to the right side of “B” and be on the right side of the 18.5″ line you drew. Nail from “B” into “H”. – Put glue on the back and bottom of “A3”. Attach “A3” as shown in the diagram. Nail from the left side of “A3” into “H”. – Put glue on the back and bottom of “A4”. Attach “A4″ as shown in the diagram 10 7/8” from “A3”. Nail from the middle of “H” into “A4”. – Add top panel support piece “FS”. It goes between piece “B” and “D” as shown in the drawings.. Apply glue to both ends of “FS”. Carefully nail into place from each end. Use clamps or a helper to get this right. After the glue on the Carcass dries, we can drill the holes for the lift and the Vent holes. The glue should take a few hours to be rock solid. – Remove the top assembly from the Firgelli lift to make it a little lighter. – Position the Firgelli lift in the center of “C1”. Mark the 4 holes with a pencil. Remove the Lift. – Drill 4 holes as straight and accurately as you can. – Drill multiple vent holes with a 1″ bit as shown in the pictures below. These holes allow component heat to leave the left side component cabinet AND allow your wires and cables to pass around the cabinet. – Secure the lift to “C1” with nut’s and bolts. I used a carriage bolt, nut, 2 smooth washers and 2 lock washers on each hole. – Plug in your lift and test it’s operation with the remote and manual switch. This is so great! Detailed! Thanks for sharing this with us!